Japanese defendants outside the International Military Tribunal for the Far East (IMTFE), also known as the Tokyo Trials, convened to try the leaders of the Empire of Japan for "Class A" crimes committed during World War II, referring to their joint conspiracy to start and wage the war. (Alphabetical Order:) General Baron Araki Sadao (1877-1966), Minister of War, Minister of Education, sentenced to life; served 11 years, released for health reasons. Major General Kenji Dohihara (1883-1948), instigated the Mukden Incident (1931), director of espionage, member of the Supreme War Council. Sentenced to death. Hanged in 1948. Kingoro Hashimoto (1890-1957), right-wing political agitator, Vice-President of the Diet of Japan and leader of the Imperial Youth Federation. Sentenced to life. Field Marshal Shunroku Hata (1879-1962), Advisor to Emperor Hirohito and commander in China. Sentenced to life, paroled in 1955. Kiichiro Hiranuma (1867-1952), Prime Minister during the 1939 Nomonhan Incident, Home Minister in Konoe government, President of the Privy Council from April-September 1945. Sentenced to life, paroled in 1952 before his death. Koki Hirota (1878-1948), Prime Minister 1936-1937, knew about Nanjing Massacre (1937), attempted to negotiate peace with Soviet Union in 1945. Only civilian leader to be executed. His sentence is the most controversial in Japan. Naoki Hoshino (1892-1978) Organized the Japanese puppet state of Manchukuo (Manchuria) with Chinese Emperor Pu-Yi as figurehead during Kanoe ministry. Sentenced to life, paroled 1955. 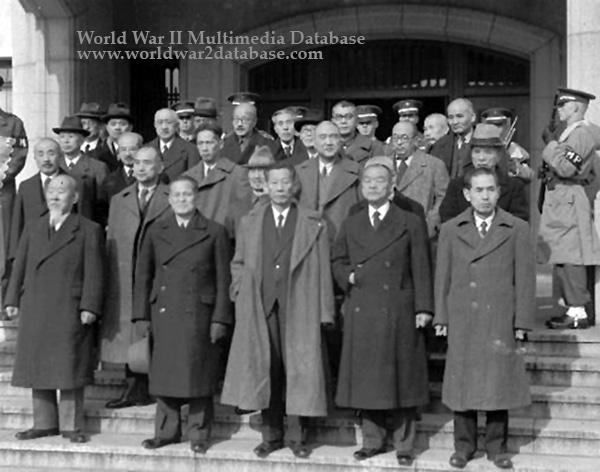 General Seishiro Itagaki (1885-1948), planned Mukden Incident (1931), Minister of War (1938) Okinori Kaya (1889-1977), Minister of Justice in the cabinets of Prime Ministers Kishi and Ikeda. Approved of opium sales in China. Sentenced to life, paroled 1955. Marquis Koichi Kido (1889-1977), served as Lord Keeper of the Privy Seal from 1940 to 1945, and was the closest advisor to Emperor Showa throughout World War II. Sentenced to life, paroled 1953 for health reasons. Lieutenant General Heitaro Kimura (1888-1948), commander in Burma, ordered Allied prisoners to build the Burma Railway, resulting in thousands of deaths. Member of Supreme War Council. Sentenced to death and hanged December 23, 1948. General Kuniaki Koiso (1880-1950), Prime Minister (1944-1945). Convicted for his brutal administration of Korea and failure to protect Allied prisoners of war. Sentenced to life. Died in prison. General Iwane Matsui (1878-1948), commander of the Shanghai Expeditionary Force that killed and raped Chinese civilians in Nanjing (1937). Sentenced to death and hanged in 1948. Yosuke Matsuoka (1880-1946) Foreign Minister under Konoe (1940-1941). Led the Japanese walkout from the League of Nations. Died before completion of the trial. General Jiro Minami (1874-1955), Governor General of Korea (1936-1942), Minister of War during the 1939 Nomohan incident. Acquitted of several charges, convicted of waging a war against China. Sentenced to life, paroled 1954. Major General Akira Muto (1892-1948), commander of the Philippines Expeditionary Force (1941). His troops were blamed for massacring thousands of Filipinos (1944-1945). Sentenced to death and hanged in 1948. Fleet Admiral Osami Nagano (1880-1947) Commander of the Imperial Japanese Navy at the time of the Pearl Harbor attack. Died during the trial. Rear Admiral Takasumi Oka (1890-1973), Imperial Japanese Navy. Navy Minister at start of the Pacific War. Sentenced to life imprisonment and sentenced to life. Paroled in 1955. Okawa Shumei (1886-1957), ultranationalist writer, declared mentally ill and hospitalized. Removed from the trial, he openly derided the trail as a farce. While in hospital he translated the Quran into Japanese. Lieutenant General Hiroshi Oshima (1886-1975), Ambassador to Germany, signatory of the Tripartite Pact (1940). Sentenced to life. Paroled in 1955. Major General Kenryo Sato (1895-1975), drew up plans for war with China, and predicted war with Soviet Union. Sentenced to life. Paroled in 1955. Mamoru Shigemitsu (1887-1957) Foreign Minister in September 1945, signed instrument of surrender. Sentenced to 7 years, paroled in 1950. Rear Admiral Shimada Shigetaro (1883-1976), Navy Minister under Tojo (1941-1944). Sentenced to life, paroled 1955. Toshio Shiratori (1887-1949) Ambassador to Italy. Architect of alliance with Germany and Italy. Sentenced to life, died in prison. Lieutenant General Teiichi Suzuki (1889-1989), economic minister (1941-1943). Sentenced to life, paroled in 1955. Shigenori Togo (1882-1950) Minister of Foreign Affairs for Japan (1941 and 1945) Minister for Colonization (1941) Minister for Greater East Asia (1945). Sentenced to 20 years. Died in prison. Chief of the Army General Staff Hideki Tojo (1884-1948), Imperial Japanese Army. Prime Minister (1941-1944). Sentenced to death, hanged in 1948. General Yoshijiro Umezu (1882-1949), Imperial Japanese Army. War Minister, commander of the Imperial Japanese Army in September 1945. Sentenced to life. Died in prison. The crew of B-29 Superfortress 42-24598 "Waddy's Wagon"